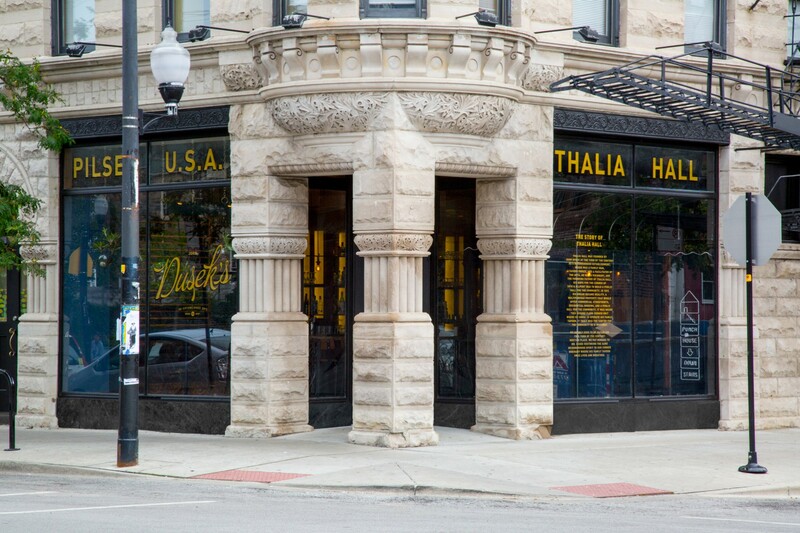 Dusek’s is in the gorgeous Thalia Hall built in 1892 by John Dusek. The building has been completely rehabbed but keeps some old timey touches with a tin ceiling, brick walls, and plenty of refurbished wood. Thalia Hall upstairs is opening soon and will have live music while Duseks’s has the food on the ground floor and downstairs the Punch House has your drink. There will be no reason to leave this building. Word is out so a bit of patience may be required depending on when you show up as they do not take reservations. We got there just shy of 7pm on a Saturday night and the wait was an hour and a half for a table for three. Good news is you can wait at the Punch House bar where the eight house made punches, bar snacks and oysters can help pass the time. We found seats at the bar upstairs and decided to eat there. 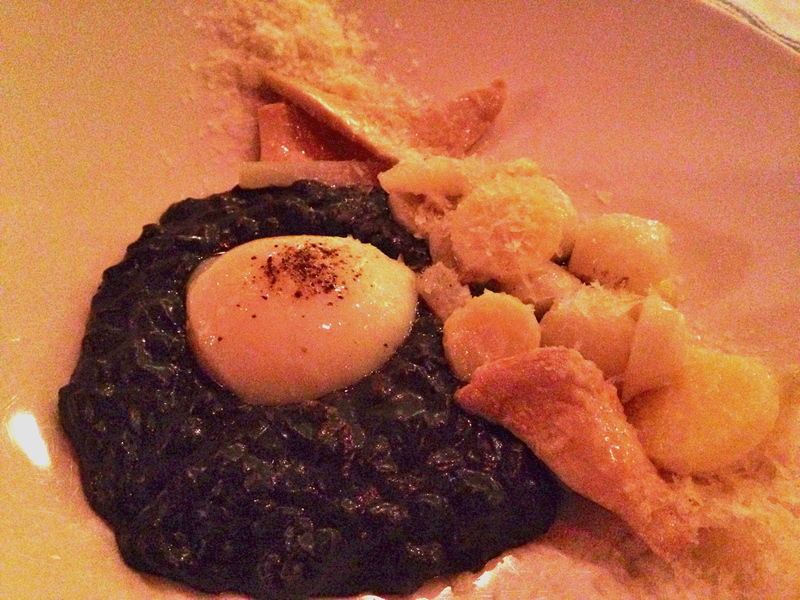 I loved everything but the winner of the night was the first dish, black and white risotto with turnip, salsify, parsnip and smoked one hour egg. This is a rich dish but I could have easily had another order. The creamy and buttery risotto paired well with of the slight spice of the root vegetables. And who doesn’t love a perfectly cooked egg on top? 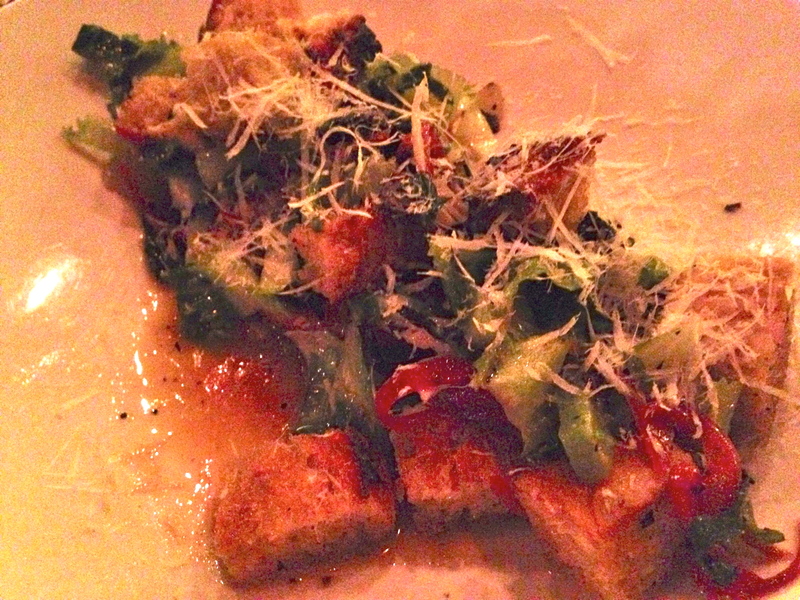 Griddled Panzanella Salad – Roasted romaine, griddled rosemary sourdough, pickled red onion, cucumber, oil-cured olives, fennel, tomato, and marjoram. This was a perfect counterpoint to the rich risotto dish with so many fresh flavors and crunchy textures. 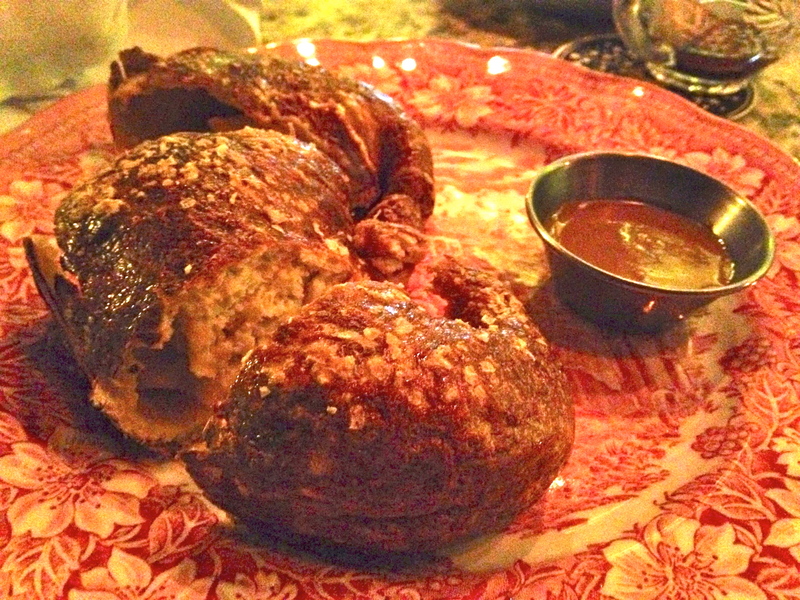 Since we were eating at the bar it only made sense to get some bar food, stuffed pretzel with beer mustard. The pretzel is puffy and flaky and one step away from a croissant. The mustard has a pungent spice that is nice and did I mention, the pretzel is stuffed with cheese. So good! 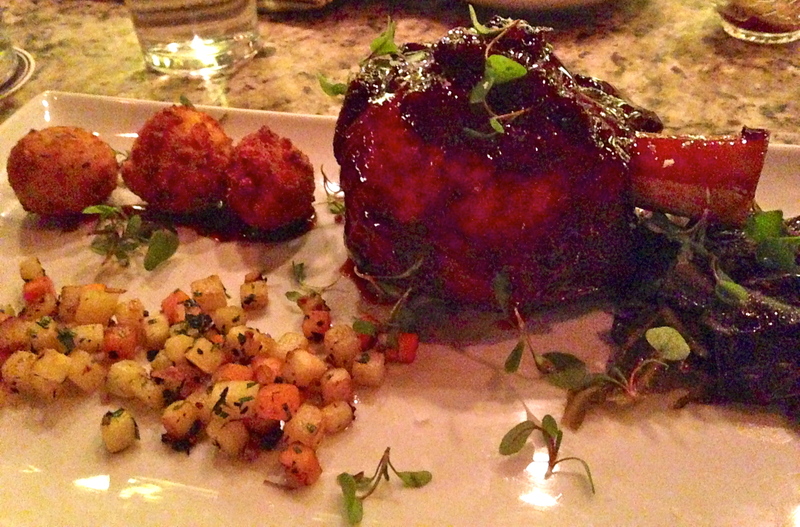 The crispy pork shank was the dish that kept on giving. It had everything saltiness, sweetness and umami with root vegetable hash, cheddar hush puppies, braised greens, and maple gastrique. The pork portion was very generous and we even had leftovers. The drink menu has 23 craft drafts that your server will pair with any of the dishes. I am in a middle of a cleanse so did not have any drinks but did have a sip of the House Gin and Tonic and it was tasty. Letherbee gin, hopped tonic syrup, water, and CO2. 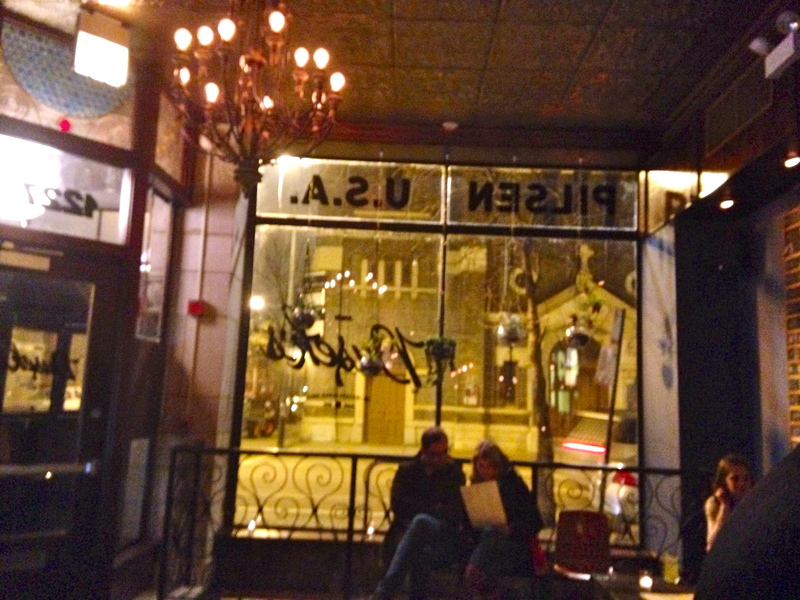 Dusek’s is worth the trek to Pilsen and wait for the table. I will be back for the food and the music when Thalia Hall opens up.